It's Valentine's Day in Coral Harbor, which is leaving Blue Ranger Ravi as emotionally blue as his azure latex suit. Ravi misses his old flame Roxy, lamenting her unconscious state prompted by being cloned into an evil avatar by the virus Evox. Said avatar wants to take advantage of Ravi's emotional weakness, devising a scheme that fools him into believing she still has feelings for him. 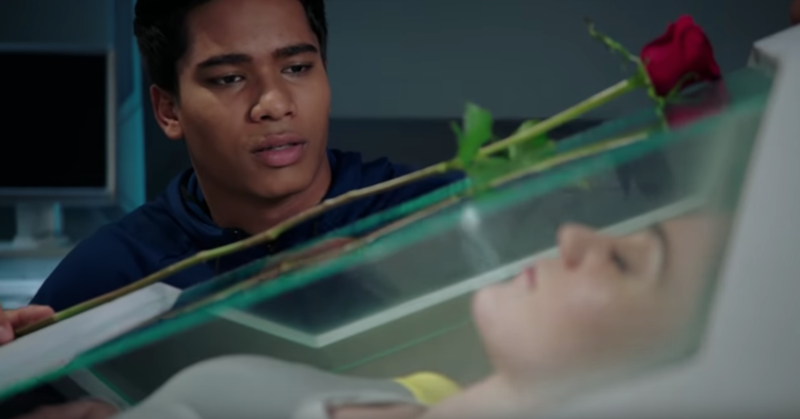 Trickery and heartache abound in the fourth episode of Power Rangers Beast Morphers titled "Digital Deception." "Digital Deception" is the first Ravi focused episode picking up a plotline that was seeded in the pilot and referenced in the prior episode "End of the Road." It's a great set up treading different territory for Power Rangers and puts emphasis on the internal conflict between Ravi and Roxy, as well as once more reemphasizing how different Beast Moprhers' villains are from past seasons. What's unfortunate is that the episode suffers from an underwhelming performance from Ravi's actor, Jazz Baduwalia. Despite only spending four episodes with this new team of Rangers, the audience has been able to glean a few distinct characteristics and personality traits. In terms of Ravi's personality, we know he is stoic and has a penchant for abiding by rules which results in personal errors such as breaking off his relationship with Roxy. And while Baduwalia greatly excels at scenes that require the intense man of action side to Ravi, his angst-filled performance in "Digital Deception" comes off as stilted and flat. It's hard to tell if it's the result of poor directing or Baduwalia's inexperience as an actor, but most of his scenes miss the mark leaving the audience wanting more. Conversely, Liana Ramirez shines through in the episode portraying the villainous Roxy. Ramirez's performance is full of personality and devilish glee, putting herself on equal footing with her fellow above average villain Blaze. What's great about Ramirez's take is she knows just when to emphasize her delivery, coming off meticulous and calculating for the planning scenes, braggadocios in her moments of triumph, and believably conflicted when she is deceiving Ravi. The rest of the cast also put out strong performances. The two other Rangers, Devon and Zoey, continue to prove themselves as capable heroes instantly noticing Ravi's behavior is off as opposed to being equally duped until the last minute. Comedic relief Ben and Betty's sub-plot involves their hunt for a bee loose in Grid Battleforce, the set up is very familiar but never crosses the border to annoying cliche. The strongest side story comes from the inventor and technical support Nate, who has become smitten with Yellow Ranger Zoey and tries to give her Valentine's Day flowers as a secret admirer. Again, this is a set-up that could easily dip into trite territory but thanks to prior information the audience learned about Nate, as well as a subtle performance from actor Abraham Rodriguez, it flows naturally with great emotional resonance. The downside to that, however, is it once again illustrates how weak the Ravi moments of the episode are. When your audience is more invested in the outcome of your side-plot than your main-plot, there is a massive issue. The episode's script, however, should be praised for its dialogue and concept. In general, Beast Morphers has hit a stride with great serialization between episodes. Multiple plotlines from earlier episodes have carried over into "Digital Deception." And it is implied that events from the episode's climax will also carry over into future stories, reinforcing the tightness of the shows continuity and raises the stakes in terms of what repercussions and consequences could arise from failed missions. "Digital Deception" is a slight misstep in what is overall still a solid season of Power Rangers. A promising story that is unfortunately marred by a stilted performance from its focus. While by no means a bad episode, it is without question one of the weaker entries of the series thus far.